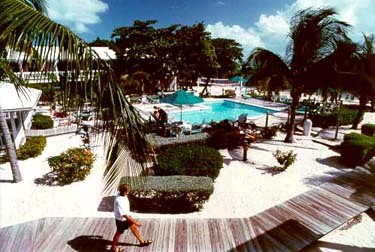 "Best Diving in the Caribbean"
"Thanks again for arranging my trip to Little Cayman Beach Resort. I had a great time at a great place. The diving was fabulous. Lots of big free swimming nurse sharks, two very curious reef sharks, tons of turtles, its a cornucopia of life, I am so glad I made that trip. Loved the resort, the people were absolutely the best I have dealt with at any resort, and the food was fantastic. I can't say enough other than had a GREAT time and will be going back!" Bob Dougherty, Mountain Top, PA.
Little Cayman Beach Resort -- Little Cayman Beach Resort is a premier inclusive dive resort on the smallest and least developed Sister Island of Little Cayman, just 10 miles long and a mile wide. Located on a private white-sand beach, bordered by South Hole Sound, the intimate upscale-40 room resort is in the heart of the Caribbean's best wall diving. Guestrooms new furnishings inspired by tropical colors and textures, Caribbean themed artwork, flat screen televisions, newly decorated bathrooms, fixtures and flooring. These surroundings capture the warmth and beauty of Little Cayman. There are a total of 40 air-conditioned, spacious rooms situated in two-story 'palm-tree height' buildings and surrounded by lush tropical foliage. 28 Poolview Rooms encircle the pool and lush, tropical courtyard. Twelve Oceanfront Rooms arelocated directly on the beach with spectacular views of the turquoise water and reef. All rooms are smoke-free. Guests may smoke on the patio or in the bar area. Reef Divers is known for its "Valet Diving" Services: Divers don't have to lug their gear every day from their rooms or on the boat. All divers receive a mesh bag upon check-in at the dive shop and place their gear outside their door on the first morning. Each diver sets up their gear the first time on the boat and after that, the Reef Diver crew changes their tanks after every dive. At day's end, the Reef Divers crew rinses your dive gear on the boat while divers take their mask, fins and wetsuits to the rinse tanks and drying room on the dock. The gourmet cuisine, luxurious accommodations and facilities are unlike any other on the island and make Little Cayman Beach Resort an excellent adult retreat for those looking for superb diving and relaxation. The high repeat guest quotient speaks for itself as individuals and dive group leaders alike enjoy the ease of using a 'one-stop' resort. Both Poolview and Oceanview room options are available. MAP = Modified American Plan - includes breakfast and dinner. FAP = Full American Plan - includes breakfast, lunch and dinner daily. plus five days of one-tank pm boat diving. use of a dive computer, airport transfers, hotel taxes & service charges, and three drinks nightly! Pricing is per person, based on double occupancy lodging, and subject to availability. Package availability is inventory controlled and subject to change. Nitrox is available at additional cost. Other durations are available. Please contact Island Dreams for complete details. Package includes: breakfast and dinner daily, six days of 2-tank AM boat diving, and use of dive computer, plus airport transfers and hotel taxes & service charges. Add five days of 1-tank PM boat dives for $200 per person. Add daily lunch for $173 per person. 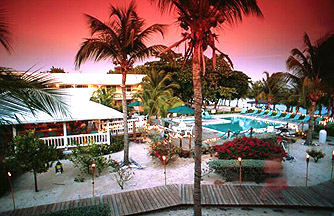 Fall Special "Carefree Little Cayman"
Enjoy the lowest prices of the year! use of a dive computer, airport ground transfers, hotel taxes and service charges. Add five days of one-tank p.m. boat dives for $200 per person. Pricing is per person, based on double occupancy lodging, and subject to availability, and subject to change. Package availability is inventory controlled and subject to change.